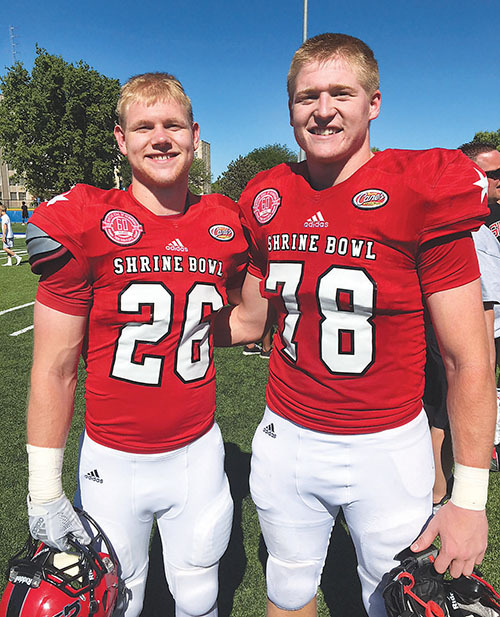 Boone Central graduates Dylan Gentrup and Jessie Sullivan, both 2018 Class C1 All-Staters, officially capped their high school football careers Saturday in the 60th Annual Nebraska Shrine Bowl Classic at the University of Nebraska-Kearney. Gentrup and Sullivan competed for the North team in the all-star contest. The North had a brief two-year win streak broken when Noah McCashland’s 50-yard field goal boosted the South to a 24-21 victory in front of an announced crowd of 4,575. Sullivan started at tackle on the North defensive unit. He was credited with a pass-breakup when he batted down a third-down pass attempt to stop a South drive early in the fourth quarter. He also recorded an assisted tackle on punt coverage late in the game. Gentrup saw action on both sides of the ball, predominately as a safety. Playing the majority of second-half snaps, he assisted on a tackle midway through the third period to help slow a South drive that ended in an interception. Although he had just two snaps at quarterback, he turned them into very productive contributions. Gentrup checked in for the first time late in the opening period with the North trailing 14-0 and facing third-and-goal at the South five-yard line. After faking a QB keep from shotgun formation, the former Cardinal lofted a perfect touchdown toss to Bryson Krull of North Platte for the North-s initial score. With 5:13 remaining in the first half, Gentrup again came in to take a shotgun snap and converted a fourth-and-one with a two-yard run.